Since 2002, India has been the largest producer of sponge iron, also called direct reduced iron (dri), in the world. Today about 20 per cent of the sponge iron produced worldwide is made in India. The growth of this industry is touted as one of the major success stories of the Indian industrial sector, after liberalisation. This industry has grown spectacularly in the last five years. There were 23 plants in 2000-2001, with a production capacity of 6.97 million tonnes (mt), today there are 206 sponge iron plants in the country with a capacity of a staggering 19 mt. And the portents are even more ominous. According to the Joint Plant Committee constituted in 2005 by the Centre to survey the sponge iron industry, as many as 225 coal-based sponge iron plants are at various stages of commissioning and construction in the country as of today.In addition, of the existing 206 plants, 77 are in the process of expanding their production capacity. The committee says that in the very near future the country will have 431 sponge iron plants with a production capacity of 44 mt. This is a very serious number from the environment and health perspective. More so because most of these plants are located (and the future ones are being constructed) in areas characterised by virgin forest, tribals and poor environmental governance. The major problem with the Indian sponge iron industry lies in the way they produce this product. The industry has grown with coal-based sponge iron manufacturing (see box Iron-age method). While globally, dri is being manufactured using gas -- the cleaner and more resource-efficient technology -- in India, sponge iron is usually produced with coal. Sources say coal-based production pollutes. "Coal-based sponge iron production is extremely polluting. Other countries do not want to do this dirty job," says an industry insider. Almost 80 per cent coal-based sponge iron manufactured in the world comes from India and about 60 per cent of this production comes from the small-scale industry in the unorganised sector. Some of these are unregistered companies and it is, therefore, impossible to have an accurate count of how many plants are operating in the country. These small players run plants that are locally constructed and fabricated and lack required pollution control facilities. Many operate without clearances from state pollution control boards. Sponge iron plants are 'red category' industries, which means they have very high pollution potential and can cause serious health hazards. The manufacturing process releases extreme heat and smoke containing oxides of sulphur and carbon, unburnt carbon particles and silica. The dust is a little less if plants use electrostatic precipitators (esps) -- to check emissions -- which most states have made mandatory, but the way they use it is questionable. Coal-char, iron dust and carbon dust collected from esps are also pollutants that need safe disposal. These plants, which have come up mostly in tribal villages, don't add much to the local economy either. Despite initial assurances of job security, few local villagers have been hired. Given that most villagers lack adequate qualification, those that do get jobs are usually hired as unskilled labourers with no insurance or medical benefits. There's no provision for in-house training and accidents are common. Most workers are hired on contract from neighbouring states, and far-off districts at higher rates than those offered to local workers. This way, factory management ensures there's less trouble from local residents, especially in case of accidents. Orissa and Jharkhand are not far behind in the sponge-iron industry race. 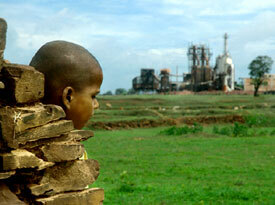 As of December 2005, there were at least 61 sponge iron units operating in Orissa. Another 44 had been granted consent to establish and are awaiting no-objection certificates. But the truth is many of these are already operating without certificates or environmental clearance. Most of these plants are concentrated in Sundergarh, Keonjhar and Jharsuguda districts, areas that are rich in coal, dolomite and iron ore deposits. These areas also have rich forest cover and are home to tribal and forest dwelling communities that depend on subsistence agriculture. 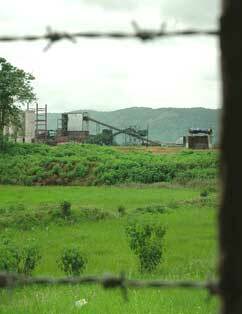 Jharkhand has about 42 functioning sponge iron plants. Most of them are concentrated in the Giridh, Saraikela-Kharsawan, West Singhbum, and Hazaribagh areas.The Jharkhand Industrial Policy 2001 talks of special incentives like "exemption from environmental clearance," for industries but there is no policy for how these industries should contribute to the local economy or control pollution. In the past two years, the state government has signed 44 memorandums of understanding (mous) for industrial projects. Of these, 42 are for sponge iron plants. Aware of the stiff opposition they faces in acquiring land for these projects, state officials have resorted to spreading disinformation among villagers to make them sell their land. In some places, they tell villagers that they have no choice but to sell their land because the government has approved the project and if they don't sell, the state will deposit money for their land in court and that will be more complicated for them to retrieve. Sometimes, they insert false reports in media that land has been acquired in the hope that it will prompt villagers to cut prospective losses and sell their land. Acquiring land for setting up a plant is always the beginning of the conflict. Industry often acquires land through subterfuge. Land in villages near Raipur, originally meant for herbal plantations, is being used by the sponge-iron industry today to set up plants. And villagers are being misled into selling their lands. There have been instances when villagers have realised that they were duped after construction started. Bholaram, an activist with the Ekta Parishad, says, "Many villagers do not know that their land is being acquired for a factory. This is a common trick employed to keep prices low." In Bemeta in Chhattisgarh, villagers claim that land bought at the rate of approximately Rs 20,000 per hectare (ha) by the state government was sold to industrialists at roughly Rs 1.25 lakh per ha. Industries are required to get a no-objection certificate from gram panchayats, but even that procedure is reduced to a mere formality, or at times, not adhered to at all. Mostly, sarpanchs are bought and documents manufactured. In Chourenga near Raipur, though the gram sabha did not pass a resolution allowing the plant to come up, blank spaces left in the gram sabha's register were used to manufacture the noc. And when subterfuge doesn't work, plain pressure does -- a combination of muscle and money power. Villagers of Tamnar and Patrapalli in Raigarh district allege that when some of them refused to sell their land to Jindal Steel and Power Limited, musclemen threatened them, hot ash was dumped on their land, and finally, their villages were destroyed with bulldozers. But it is not only the Jindals; allegations of illegal use of public resources are quite common.In Chourenga, a canal was filled up and converted into a road by a sponge iron plant. The state government, while admitting that the canal was given on lease to the plant, refuses to admit that a road has been constructed. 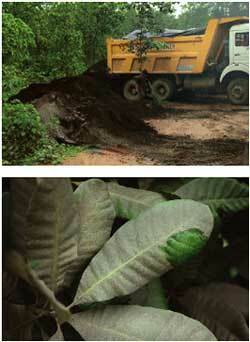 In Bemeta, a nursery was occupied and converted into a road after uprooting 5,000 trees. In Ratanpur near Sundergarh in Orissa, Mahavir Hi-tech Chemicals Pvt Ltd bought around 30 ha along the Ib river in 2004 for a sponge iron plant, without even a gram sabha hearing. The plant affects four villages in the vicinity. A gram sabha was called after local protests, by Kiran Club, a Balijuri village youth club run by a group of tribal girls and boys. But the meeting was adjourned time and again by local administrators, first on grounds that there wasn't a quorum, though the villagers insist that the required number of people were actually present. Then on grounds of law and order breakdown, when meetings turned violent and police resorted to lathicharge. Villagers and the youth club members say, the company sent goons to disrupt the sabha proceedings. It took five attempts at holding a gram sabha meeting before a resolution could finally be passed on February 28, 2005. Nearly 4,000 people attended the meeting and amid police lathicharging, said "no" to the proposed plant. The factory has been stopped for now, but rumours are afloat that it will make a comeback bid under a different name and in the guise of an "integrated steel plant". However, villagers know the score this time. "We don't want any plant, steel or otherwise," says Srimati Bag, a farmer's wife who's taken a trip to sponge iron plant sites in Keonjhar and seen for herself what it's like. "Once they make the boundary wall they can build anything inside, even a sponge iron plant." Ratanpur may have got a reprieve, but in places like Kuarmunda and Podajalanga, plants have not only acquired land without gram sabha approval, they have even been built and continue to operate full steam despite strong protests by local residents. However, it's not that villagers and tribal people are dumb spectators to this growth of the industry. There have been protests and in some cases, have taken a serious enough turn for industries to close plants. Chourenga in Raipur is a case in point (see box Epicentre of protest). Anger, fear and suspicion are rife among tribal people who say they have been duped by factory owners and local administrators into giving up their lands and are now being threatened by the police and goons hired by the industrialists to desist from protesting. In Nayagaon village in Chaibasa, Jharkhand, villagers woke up one morning, looked at each other's black faces through the thick falling dust and simply couldn't take it any more. So, armed with bows, arrows, sticks and whatever other weapons they could find, about 1,000 tribal men, women and children of Nayagaon village stormed the gates of Sai Sponge India Ltd on April 7, 2006. They ransacked the factory, damaged property and equipment worth Rs 1 crore and brought production to a halt. "We had had enough," says villager Mangal Singh Tamsoy. "Ever since it started in 2004, there have been problems. We had no idea what kind of factory was being built next to our fields. We were duped." The land transactions took place without gram sabha approval. The Ho Samaj Mahasabha in Chandil has filed a case in the Jharkhand High Court accusing Sai Sponge management of violating the Panchayats Extention of the Scheduled Areas Act, which clearly states that land acquisition for industrial and development projects have to be first approved by the local gram sabha or panchayat. Following the April violence, the plant had to be shut down for 58 days. Work resumed on June 4, 2006, after it finally installed an esp and after factory owners reached a compromise with the villagers. According to the compromise formula, the plant promised to give the village Rs 1 lakh a year for "developmental work"; it would send a doctor for free medical checkups in the village once a week and the top student in the village would get a college scholarship. But villagers would be responsible for any further damage to the company. Newly formed states such as Chhattisgarh and Jharkhand are leaving no stones unturned to get the tag of "developed states". And to get this tag, they are industrialising rapidly, putting at stake the basic livelihoods of people. The regulatory structure is, however, weak. Gautam Bandopadhyaya of the Nadi Ghati Morcha says, "Industrialisation is chaotic. Zones are coming up without any evaluation of whether the area has the required resources, like water and power, to support industries and the people living in the region. There is no exhaustive and long-term cost-benefit analysis done either." Most community-based organisations and ngos have a very poor opinion of the state pollution control boards. Environment impact assessment is conducted poorly and communities are kept in the dark about the nature of the project till the very end (see box Chhattisgarh impact). That the boards in both these states have failed to regulate industrial pollution is clear from the way sponge iron factories flout all the regulatory norms. There are widespread allegations of corruption against board officials. A raid in January 2006 at the residence of A K Sharma, member secretary, Chhattisgarh Environment Conservation Board (cecb), uncovered more than a crore of rupees in unaccounted property. The interference of politicians in the working of boards is also quite apparent. The Jharkhand State Pollution Control Board is headed by an mla against whom there are allegations of misconduct. In its 2003-2004 annual report, the Central Pollution Control Board summed up the poor performance of cecb "... many of the existing sponge iron producing industries have expanded and increased their production without obtaining necessary approvals. (State boards) have to exercise strict vigil to ensure that such plants should not come up without proper and adequate pollution control systems". Besides regulatory failure, the industrial policy of both these states contributes to the disarray effectively. The Chhattisgarh industrial policy wants to "take the state to the category of developed states to bring prosperity to the people. It is necessary that the rate of industrial growth increases substantially". By assuming that industrialisation is an indicator of a "developed state", policymakers have failed to acknowledge the need for a balance. The policy also claims that creating employment opportunities is one of the priority areas of the state government, and talks of promoting entrepreneurs from the tribal community to become partners in industrial development but fails to follow up this promise with tangible incentives. The policy says that small-scale and cottage industries will be given special incentives to create employment opportunities. At the same time, a list of "negative industries" has been issued, which includes most rural-based cottage industries, which are not entitled for any incentives. Says Lalit Surjan, chief editor of Deshbandhu, "The government is not concentrating on promoting traditional industries like rice mills, shellac and beedi manufacturing. These industries are socially and economically important." Jharkhand's industrial policy has made mining and mineral-based industries one of the thrust areas for industrialisation. It promises 'speedy' environmental clearance procedures and self-certification for purposes of compliance with environmental and labour laws in some industrial sectors. That the government is rolling out the red carpet for investors is obvious, since the policy talks about "making industrial investments in the state competitive vis--vis other states". Administrative and legal reforms are talked about in the policy.However, the emphasis is on ensuring "single point contact" and "time-bound clearance" for industrial investments. Labour laws do merit a mention -- but only the need for "simplification" of labour laws is talked about, though labour conditions in the state are nothing to write home about. Says the general secretary of the All India Trade Union Congress, "There is open flouting of labour laws in the state. Minimum wages are not paid; most people are being recruited on a contract basis, even though the jobs are of a permanent nature. Ensuring safety of the workers is only on paper." Accidents are common, especially in sponge iron plants. That the state needs a balancing act is obvious. The new states are generously endowed with natural resources -- they are particularly rich in mineral resources, have sufficient water and extensive forest cover. However, using these resources for industrial development presents an ecological, social and political challenge. Sizeable portions of both these states are forested (42 per cent of Chhattisgarh and 29 per cent of Jharkhand), and much of the state's mineral resources are located under forests. The states have a demographic profile skewed towards traditionally disempowered groups -- tribals constitute 32 per cent of Chhattisgarh's population and 28 per cent of Jharkhand's. Very often these groups depend on lands that are mineral rich. Take for instance Bastar district -- it has huge iron ore reserves. Fifty-four per cent of the district is forested -- much of it densely. Nearly 70 per cent of the population of the district belongs to the scheduled castes or tribes. The movement for the creation of Chhattisgarh and Jharkhand was a demand for tribal assertion as well as a movement for local control of resources. It was born out of a strong feeling of resentment over resources being used to make others rich, of resources not being used for local development. But things haven't changed for the better. There is an urgent need to change the definition of 'development'. Uncontrolled industrialisation is not development. There is enough evidence to establish that environmental conservation must go hand in hand with economic development because development which destroys the environment will create more poverty. This is because the poor depend on nature for their daily survival -- for them the gross nature product is more important than the gross national product.